Exhibitors will be expected to display or parade their animals as directed by the Superintendent; to accept the stall assigned without controversy; to keep their animals in an attractive appearance, and to cooperate with the Department in every way that may serve to increase the educational value of the show. No stalls will be promised until after entry deadline date. Stall space may not be decorated until all stall space is assigned. Exhibitors must note when livestock will be judged and be in the ring promptly and/or on call. Failure to comply with this rule may exclude exhibitor from competing. Decorations with ribbons or ornaments previously won by animals at shows shall be prohibited until after the awards have been made in their respective classes by the judge. 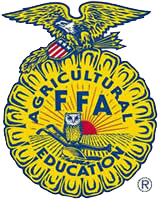 4-H and FFA members may enter the same animal in both open and youth competition. Exhibitor defined: Exhibitor will be the individual or partnership listed as current owner on the registry certificate at the time of entry. Original registration papers or dairy leasing program project forms showing ownership by June 1, plus Certificate of Veterinary Inspection (CVI) must accompany animals. These will be checked and approved before animals can be unloaded. No pending papers will be approved. For cows, the ownership dates will be by January 1 of the current year, and for calves and heifers the transfer dates will be by June 1 of the current year. Note: Holstein USA will use the date the transfer was received by the Holstein Association. No back dated transfers are allowed. All papers must be available until judging has been completed. There will be no exceptions to this rule. Dress Code: In an effort to maintain positive public image, acceptable dress will be either dark or white pants and white shirts or 4-H attire. Bib overalls or blue denims will not be allowed in the show ring. This will be enforced by the class organizer. Management: The management reserves the final and absolute right to interpret these rules and regulations and will determine all matters, questions, or differences in connection with the show. Rotation of show order will be at the discretion of the dairy superintendent and will be announced prior to the show date. The same classification and premiums as stated above apply to each breed. Use the following Section designations for breed classes. Animal bred and owned by a Junior exhibitor. Dam of animal exhibited must be owned by the exhibitor at the time of breeding (Dairy Cattle).